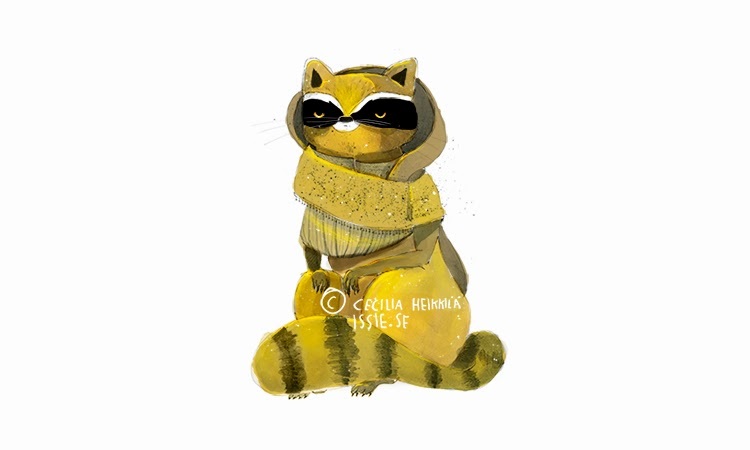 blog of issie - drawing, cats and stuff: Friday furry raccoon. Love them raccoons. I know they're not very popular in North America, but how I actually enjoyed seeing them sneaking around our yard when I lived there. Many are the stories and encounters with them, but I especially remembered one night when I was up working and I could tell someone was looking at me. In our house in Vancouver BC our entrance door had glass windows, and I looked out. It was dark and late autumn but I saw two glowing eyes stare back at me. Then I remembered. We usually put our trash outside the door so we could dispose it in the garbage when we left. But this day we completely forgot about it, which for the racoons resulted in a stinky awesome bag of supper, impossible to resist. Since we were more fascinated than bothered about the fact that we had to clean the mess later (I know most people would say this is a mistake, but please excuse us for being curious swedes, not used to being close to those animals), we sneaked up to the door, and we could actually watch two raccoons piercing the plastic and digging through the bag in search for something to eat - just casually throwing out the less interesting things - like tiny pieces of paper and food package. My face against the window, being on a couple of centimeters length from the hungry poor fellow. I will never forget the look one of the raccoons had when searching through the bag while being terrified about seeing me on the other side of the glass. A rebel. Those black tiny little eyes fixed at me, conquering fear for food. Such courage should always be rewarded. They found some avocado and half an apple at least. We got a night of cleaning the chaos with plastic gloves, but I would say it is one of the most memorable times with Canadian wildlife that I will always remember.